Terminus, the #1 rated account-based marketing (ABM) execution platform and leader of the ABM movement, today announces it has rolled out new key features for its account-based platform. 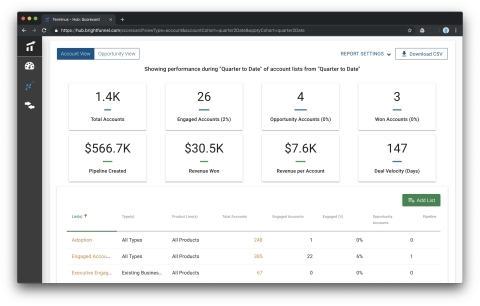 Terminus’ capstone feature, Account-based Scorecard, has the deepest measurement capabilities of any ABM platform, offering the only account-to-revenue view of account-based and traditional marketing program performance. It also empowers customers to easily measure across lifecycle stages, helping B2B marketing teams focus on quality experiences that drive revenue over high-volume, low-quality engagements that drive leads. The account-centric measurement capability incorporates outbound and inbound activities executed by both marketing and sales teams into a single scorecard and reporting framework. Additionally, Terminus now provides digital advertising capabilities reaching audiences in global markets and enabling account-level targeting across all regions around the world. The new display advertising is fully GDPR and CCPA compliant alongside the already available integration to LinkedIn for global reach. Key to Terminus’ advertising functionality is the ability to manage fraud concerns, limiting ad fraud to less than two percent - which is well below the industry average. All of these new capabilities align with the TEAM framework to provide the easiest way possible for B2B marketers to operate, scale and measure account-based initiatives. Terminus’ Account-based Scorecard provides marketing executives and practitioners the ability to see an overview of every program’s true influence on revenue and compare different marketing and sales channel efforts in a single place. Customers can also get out-of-the-box reporting on the metrics that truly matter to the modern marketer, including pipeline influenced, revenue influenced, account-level engagement as a percentage of the total available market, win percentage and deal velocity. All of these measurement tools fill a widespread need for B2B marketers to better launch, scale, measure and rapidly improve upon their account-based approach. As a further testament to Terminus’ industry-leading technology, 451 Research recently announced the company as a Q1 2019 Firestarter innovation award recipient. 451 Research’s Firestarter program recognizes exceptional innovation within the information technology industry. The program is exclusively analyst-led, allowing its team of technology and market experts to highlight organizations they believe are significantly contributing to the overall pace and extent of innovation in the technology market. To learn more or request a demo, please visit: https://terminus.com/request-demo/.